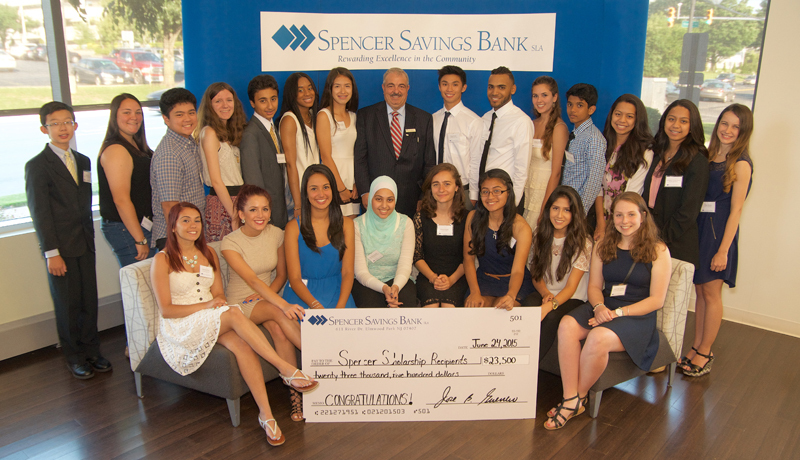 Spencer Savings Bank, a community bank headquartered in Elmwood Park, awarded 31 local students a total of $23,500 in scholarships during a ceremony held on June 24, 2015. The bank’s annual scholarship program is designed to recognize and encourage those with academic potential as they plan their future educational endeavors. As part of this year’s event, 16 high school students each received a $1,000 scholarship, with an additional 15 middle school students each receiving a Coverdell Education Savings Account in the amount of $500. Since the inception of the Spencer Scholarship Program in 2002, a total amount of $315,500 has been awarded to students from the bank’s service area, including Clifton, Cranford, Elizabeth, Elmwood Park, Garfield, Garwood, Lodi, Lyndhurst, North Caldwell, Nutley, Parsippany, Saddle Brook, Union, Wallington, Wayne and Wood-Ridge. In addition to the scholarship program, Spencer also hosts financial education programs in area schools.